The launch of a new mega satellite providing coverage over Asia will help fast-track Digital India and financial inclusion initiatives, according to a leading satellite industry expert. Deepak Mathur, Executive Vice-President, Global Sales at SES Video, said the successful launch of SES-12 recently would help support India's growing direct-to-home (DTH) TV market, as more and more consumers in rural India embrace the medium. "The satellite will be able to help accelerate the country's push towards a Digital India, the government's vision to digitally empower India and transform connectivity in the country," said Mathur. "SES-12's high throughput capacity over South Asia and India could potentially help meet the enormous demand for capacity that will be needed to fast-track Digital India, and financial inclusion initiatives," he said. The senior executive at SES, one of the world's leading satellite operators, said that in line with the Telecom Regulatory Authority of India's (TRAI) recent directive to allow mobile and Internet services in Indian airspace, the satellite's concentrated beams could also provide highly cost-effective capacity to enable inflight connectivity services. 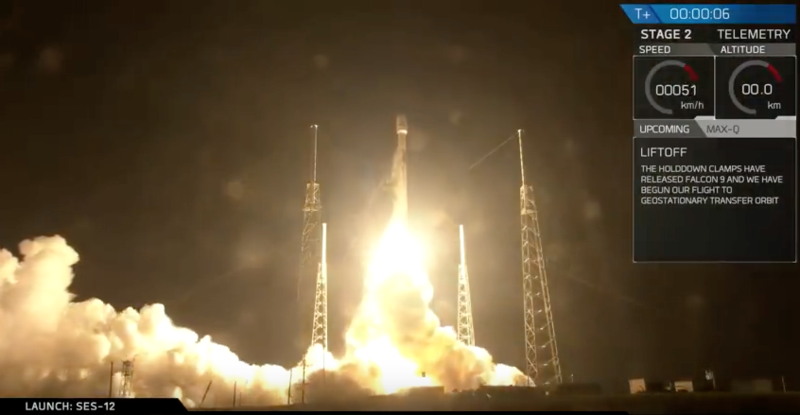 SES-12, which is uniquely designed with state-of-the-art wide beams and high throughput beams, was successfully launched onboard a flight-proven SpaceXFalcon 9 rocket from Cape Canaveral in Florida, US, in early June. It is set to replace and augment the services currently being provided on SES' NSS-6 satellite. Together with SES-8, SES-12 will reach 18 million TV homes from its orbital position. The satellites will provide pay-TV operators the reliability and scalability to elevate viewing experiences by adding more content and delivering higher-quality picture quality to address the ever-increasing audience demand for High Definition (HD) and Ultra HD content, the company said. The cutting-edge technology satellite, which will provide coverage from the Middle East to Australia, effectively combines two satellites into one - offering powerful Ku-band wide beams for broadcast and media applications, and high throughput spot beams for providing internet connectivity, reliable cellular services and content targeted at specific language groups. "With its dual capabilities of both wide beams and high throughput spot beams, SES-12 will serve to enhance connectivity for people and businesses in remote and unconnected parts across Asia, where providing rural connectivity and eliminating the digital divide is a key priority for many governments. SES-12 also brings augmented capacity to enable satellite broadcasting and direct-to-home (DTH) services across Asia-Pacific," explains Mathur. SES-12 is one of the largest geostationary satellites that SES has ever launched. The spacecraft also has a Digital Transparent Processor (DTP) that increases payload flexibility to provide much more customisable bandwidth solutions to SES's customers. Specifically over India, SES has five satellites - NSS-12, SES-8, NSS-6, SES-7 and SES-9 - currently operational. SES-12 will be replacing NSS-6 as the largest satellite to offer services and capacity over India. The company's primary customer in the Indian market is Antrix, the commercial arm of the Indian Space Research Organisation (ISRO), with whom it has worked to help augment the enormous demand for satellite connectivity over India. Mathur added: "ISRO has a pivotal role to play in the development of new space technologies and in making space more accessible, and affordable. "We are exploring potential areas of collaboration with Indian partners to see how we can work together to advance the development of space technologies." Luxembourg-headquartered SES provides satellite communications services to broadcasters, content and internet service providers, mobile and fixed network operators, governments and institutions around the world. Its latest all-electric SES-12 spacecraft was built by Airbus Defence and Space and joins SES' network of seven geostationary satellites and 16 medium earth orbit(MEO) satellites across Asia-Pacific and the Middle East.